Worldwide, 19th Century Lithographed Trade Cards & Ephemera, hundreds of items including trade cards mostly European, other cards including seasonal, cut-to shape figures, stamp related, etc. 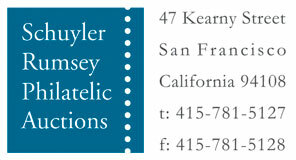 ; condition mixed with many interesting items throughout, ex-F. Langford. Worldwide, Astronautic Signed Commemorative Covers, 1950-70's, group of 34 covers and cards signed by various astronauts and other aeronautic personal; includes items from Russia, U.S. including Apollo 14 recovery cachet cover signed by Alan Shepard and others, Australia and Czechoslovakia; inspect. Worldwide, Boy Scouts Topical Collection, extensive 8 volume Boy Scout topical collection; not the typical collection as this collection has varieties and key items; generally Never Hinged and Very Fine. Worldwide, Christopher Columbus Massive Topical Collection 1893-1993, huge collection assembled over many years featuring stamps, covers with postal stationery issues, currency, coins, ephemera, etc., features various U.S. 1893 mint and used Columbians to $2, 1893 Columbian Expo postcards and assorted admission tickets, 1914 $5 and 1917 $1 U.S. paper currency, some 1893 Columbus commemorative half dollars, also Worldwide stamp and cover sets and singles, art prints, research material and more, diverse collection with value throughout, excellent lot for the specialist or topical dealer, condition varies, generally fine to very fine. Worldwide, Scouts Topical Stock, neatly mounted on 3 or 4 line black stock cards and larger type cards for souvenir sheets, predominantly never hinged with minimal duplication, very attractive and ready for immediate resale or internet, values to $70 with most between $20- $30, many scarce items; retail exceeds $17,000. Worldwide, Topical Covers, dealer's back up stock of worldwide topical covers of around 700 covers all sleeved and priced from all over the world with both FDC's and commercial mail, includes a wide variety of thematic subjects including Fauna and Flora, huge variety with minimal duplication; owner's retail exceeds $10,000. 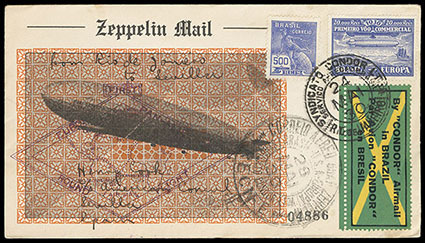 Worldwide, Zeppelin Flight Mail, 1929-33, group of 13 covers with Brazil (6) including Z110b post card from Pernambuco to Freidrichshafen, 1930 Brazil from Rio de Janeiro to Pernambuco, United States (2) incl. #C18 use, Spain (3) via Sevilla, and Germany (2) comprising post card via LZ-127 to Orange N.J. and #C37 on flight cover to U.S., F.-V.F. group. United States and Worldwide Literature, library balance comprising Winter Understanding Transatlantic Mail Vol. 1, Hubbard & Winter North Atlantic Mail Sailings, Luff United States, Hutson New South Wales, Pat Paragraph bound original set (worn leather), Crown CSA Provisionals, Jephcott PH of Nova Scotia and New Brunswick, etc. ; some usual wear, F.-V.F.